ACHR BANG BUA CANAL: A renovated public walkway, top, along the canal in Bangkok, where residents are helping to design cleaner places to live. Proyectos Arqui 5 CA Images from before and after a stair upgrade in La Vega, Caracas, Venezuela. Jiko Ya Jamii KIBERA, NAIROBI, KENYA: A community cooker is fueled by refuse that residents collect in return for time using the oven. Abir Abdullah/Shidhulai Swanirvar Sangstha BANGLADESH: One of Mohammed Rezwan’s floating community lifeboats that serve as schools, libraries and health clinics. PUNE, INDIA: In this booming city some schools come to the students: buses equipped with classrooms pick up the students where they live. Medellín EDU, Alcaldía de Medellín, Metro de Medellín, and Center for Urban and Environmental Studies EAFIT MEDELLÍN, COLOMBIA: This city’s worst slums have seen the development of a cable car system, libraries, parks, public schools and pedestrian walkways. 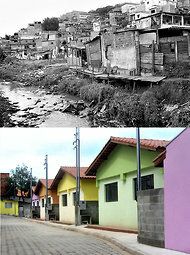 Prefeitura do Municipo de Diadema DIADEMA, BRAZIL: The two images of this industrial city outside São Paulo shows what came before, top, and after, below, a sweeping development. Haas&Hahn A painting project has brought art to the Santa Marta favela in Rio de Janeiro. This is a design show about remaking the world, in other words. And that’s thrilling, whether it’s happening in Cupertino, Calif., or Uganda, where H.I.V. infects hundreds of people a day, and the latest news cellphone-wise has been the design and distribution of a text-messaging system that spreads health care information. Text to Change, as the project is called, entails a collaboration by a pair of Dutch communication and technology specialists with local phone service providers and health care organizations. In Kibera, an area of Nairobi, Kenya, and one of the densest slums in Africa, the challenge was different. Traditional wood and charcoal fires cause rampant respiratory disease there. Refuse fills the streets. So a Nairobian architect designed a community cooker, fueled by refuse residents collect in return for time using the ovens. From cellphones and cookers to cities: in Thailand, a public program called Baan Mankong Community Upgrading has, for the last eight years, been improving conditions in hundreds of that country’s 5,500 slums, bringing residents together with government and nongovernment agencies to design safer, cleaner places to live. 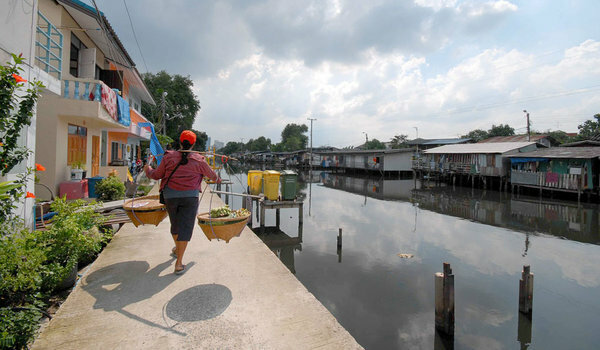 Along the Bang Bua Canal in Bangkok, where thousands of families have long squatted in rickety stilt houses linked by flimsy walkways, all teetering above polluted floodwater, architects from nearby Sripatum University were enlisted to devise row houses, detached houses and semidetached houses, along the lines of what residents said they wanted. Hundreds of decrepit stilt structures were demolished, new homes built in their stead, often from recycled doors and timber, on solid ground and near the former stilt houses, so that communities would not be broken up and families uprooted. More than just upgrading housing and infrastructure, the strategy in Bang Bua included low-interest loans and renewable 30-year leases for slum residents, making them, for the first time, legal stakeholders in their properties. This helped to end the old cycle of evictions (in many slums around the world evictions are used to clear space for shopping malls and expressways) that left the poor in Bangkok perennially helpless and hopeless. With money from the loans, the residents of Bang Bua also decided to build a center for the elderly and disabled, and to set aside a fund for libraries, child care and school fees for the poorest families. This show follows a smaller one Ms. Smith organized in 2007 at the Cooper-Hewitt. That exhibition included among its 34 objects a filtered drinking straw that prevents the spread of typhoid and cholera; a bamboo treadle pump that helps poor farmers in Cambodia and India extract groundwater during the dry seasons; and the Q Drum, a doughnut-shaped plastic container, easily rolled, even long distances by children, which is used to transport up to 13 gallons of water. The 2007 exhibition set the stage for this larger undertaking about whole cities, which couldn’t be timelier. We live in an era of unprecedented urban migration. Ms. Smith mentioned the billion people living in informal settlements, or slums. That number is projected to double by 2030, triple by 2050, according to the United Nations Human Settlements Program. By then one of three people on the planet will supposedly be living in favelas in Brazil, barrios in Ecuador, shack settlements in South Africa, bidonvilles in Tunisia or chapros in Nepal — the names are nearly as endless as the number of these sprawling, unplanned, impoverished places. Ms. Smith spent a couple of years seeing what designers have been doing to improve living conditions in them. As at Bang Bua, one lesson seems strikingly obvious: the need to solicit the people living in poverty to come up with their own solutions. In so many slums — Dharavi in Mumbai, India; Corail in Bangladesh; Cape Town, South Africa; and in American cities too — the poor are left out of the process. But urban-renewal projects always work best when they’re ground up, not top down. So in Diadema, a huge industrial city outside São Paulo, Brazil, 30 percent of the population used to live in favelas during the 1980s, when the homicide rate was shooting into the stratosphere. The government turned to residents for advice, asking them to help set priorities for the city budget, suggest upgrades for neighborhoods and approve construction projects, which employed workers who lived in the communities. A land-tenure program awarded residents the right to stay on their property for 90 years, encouraging them to maintain their homes and invest in the neighborhoods. Residents helped to widen and pave streets, install clean-water and sanitation systems. Today, according to Ms. Smith, three percent of Diadema’s residents live in favelas, and the annual homicide rate, a standard measure of civic order and public health, has dropped to 14.3 per 100,000 from its high of 140 during the 1990s. Ms. Smith also includes in the exhibition the by-now textbook case of Medellín, Colombia, once the world capital of drug cartels, murder and despair. Progressive political leaders there, starting roughly a decade ago, decided somewhat counterintuitively to invest most heavily in the worst slums, building a cable car system to link the city’s center with the isolated, crime-ridden areas that blanketed the surrounding hills. New libraries and parks, public schools and pedestrian walkways were built around the pylons of the transport system so that the most beautiful and ambitious public architecture in the city went into the poorest neighborhoods. Medellín became a changed place. In Dakar, Senegal, designers working with community organizers developed an irrigation system to recycle wastewater in the crowded slum of Yoff. And in La Vega, one of the settlements lining the steep slopes around Caracas, Venezuela, a team of architects, engineers working with a geologist, again taking cues from residents, devised a series of new stairs and plazas, so impassable climbs became manageable, neighborhoods were linked and nobody was forced to move out of their homes. I was struck by a map in the show that located 238 schools in Kibera, that dense settlement in Nairobi, which occupies a territory smaller than Central Park. I recall discovering a similarly astonishing number of schools and universities on trips to Gaza. Ms. Smith points out the case of Pune, one of India’s many booming cities, where laborers constantly move from one informal settlement to another, following construction projects and taking their families with them. As a consequence their children often aren’t enrolled in school. In response a team of designers decided a decade ago to bring the schools to them, via buses equipped with classrooms for 25 that pick the students up where they live. Students receive old-fashioned handbooks that keep track of academic progress and list phone numbers for education centers around Pune (a second bus network is under way in Mumbai) so that when the children move, their parents can find schools in the new neighborhoods and teachers can pick up where the students left off. One last example, from Bangladesh: Mohammed Rezwan, a local architect, has designed “community lifeboats” that serve as floating schools, libraries and health clinics. With sea levels rising, nearly 20 percent of the land there is predicted to be under water by 2050. The low-lying Ganges-Brahmaputra Delta, the most densely populated area in the world, will flood. Working with native boat builders Mr. Rezwan adapted the traditional flat-bottom bamboo riverboat to create his Noah’s Arks. He outfitted the boats with waterproof roofs and solar panels, installed computers, high-speed Internet and portable solar lamps made from recycled kerosene lanterns. Traditional materials, local building techniques and renewable energy sources produced a model of contextual design. I’m hoping to check out this fleet and also a few of the cities the show celebrates, to see how they’re doing, firsthand. Meanwhile I gather there are now 54 of Mr. Rezwan’s boats in operation in Bangladesh, serving 90,000 families. That’s design guru stuff too.